While playing around in my Etsy shop this last week, I noticed there was a new feature. 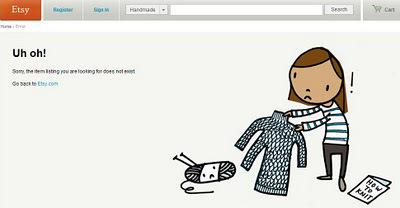 Etsy has given sellers a dashboard to put all your shop information in one convenient place. I love it! You can see some quick stats and it compares them to the previous month and the previous year. I like seeing the tally of how many sold orders are not paid or not shipped and how many orders will expire in the next week, how many are expired, and how many are sold out. At the top are links to the more detailed information for your shop and at the bottom is a showing of recent shop activity. Read more about the dashboard on Etsy's blog. Who Controls Your Etsy Shop? Is your Etsy shop really yours? You may own your merchandise and may even have trademarked your business name, but that Etsy shop doesn't belong to you. I was reminded of this recently as I read about shop owners whose shops were shut down temporarily or permanently and Etsy had ultimate control over the situation. "That will never happen to me," you say? You agreed to a pretty long list of terms and conditions when you joined Etsy and started selling. Etsy makes the final call on whether you exist on their site or not. I suggest you read about some of these experiences and see what they've gone through. One of my sons has a friend who was able to quit her day job when her Etsy shop became successful. Things were going amazingly well for years and then, one day, she received an email from Etsy telling her that her shop had been closed because an item she was selling violated somebody else's copyright. Even though she tried taking the item out of her shop, explained that she wasn't aware that someone had a copyright on the word she was using on that item, and promised to be more careful, the shop stayed permanently closed. Etsy deleted it and she was suddenly out of business. No chance to alert customers and let them know where to find her. No access to product photos and descriptions so she could set up on another handmade site. Out of curiosity I Googled the word/phrase she had used and although it was part of the title of a book (where the complaint originated), it was used so commonly across the webiverse that I don't think they had a case for establishing a "copyright." She still had no right to even confront her accuser. I recently had someone contact me about an item in my shop, asking me to remove it because it was a copy of someone else's work. After I got over being furious...and that took some time...I replied to them and explained the process behind that particular design, the inspiration, and how it ended up the way it did. I also explained that it's not uncommon for more than one person to come up with an idea, especially when working with cultural symbols. The complainer never responded to my explanation, but I was still a little anxious since just an accusation can get a shop shut down. I'm not saying that you should leave or avoid Etsy. It's still the best platform for me as a seller and I plan to stick with it. Other similar online sites have the same risks. What I am saying is to be prepared. We bought our own custom domain (www.nativeandpilgrim.com) early on, keeping our customers connected to us if we move our shop (plus it looks better than the Etsy shop address). My goal is to eventually have our domain point to a site that combines this blog and showcase and link to our shop rather than sending it directly to Etsy. I've also realized I need to preserve my product photos and descriptions somewhere, just in case.